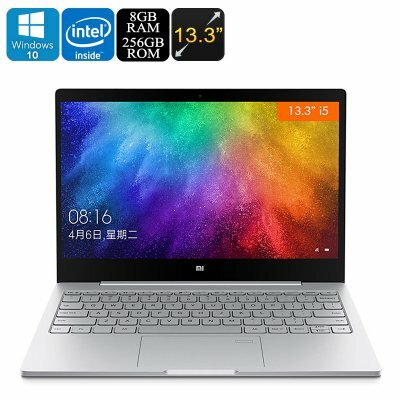 Successfully Added Xiaomi Air 13 Windows Laptop - 13.3-Inch IPS Display, 1080p, Intel Core i5, 8GB RAM, 256GB Memory, NVIDIA, Fingerprint, 5400mAh to your Shopping Cart. The Xiaomi Air 13 is a stunning Windows laptop produced by one of China’s leading and most innovative tech companies. This beautiful laptop features a sleek body and an exceptionally smooth design which gives it a premium look. The laptop itself is light in weight, making it easy to carry around to school or upcoming business trips. The Windows 10 operating system supports all the latest MS Office features as well as games, media, and entertainment. Whether you use this beauty for business or fun – it is sure to meet all your demands. Xiaomi has managed to pack some remarkably powerful hardware inside the body of their Air 13 notebook. This Windows laptop comes packed with an Intel Core i5 processor that has been clocked at 3.1GHz. Additionally, it treats you to a whopping 8GB DDR4 RAM and 256GB internal memory. With all this hardware at your side, you will be able to enjoy the latest software features and there will be plenty of space to store all your files. On the 13.3-Inch IPS display of the Xiaomi Air 13 notebook, you’ll be able to undergo a stunning visual experience in crisp Full-HD resolutions. The 1080p display of this Windows laptop is guaranteed to bring your media experience to the next level. You will furthermore be treated to AKG Dolby Audio Premium Surround Sound which will further increase your overall audio-visual experience. The laptop comes packed with a powerful 5400mAh battery which brings along hours’ worth of usage time. Thanks to this, you won’t have to worry about running out of juice while using your laptop throughout the busiest days at school or in the office. With Dual-Band WiFi support, the Xiaomi Air 13 notebook lets you browse the web at lightning speeds. Your Windows laptop furthermore supports Bluetooth, USB-C and comes with an HDMI input. With its fingerprint sensor, this laptop PC brings along great security and easy access to all your files. Additionally, it treats you to a 1MP front camera as well as a beautiful back-lit display that lets you work both day and night. The Xiaomi Air 13 Notebook comes with a 12 months warranty, brought to you by the leader in electronic devices as well as wholesale laptops..